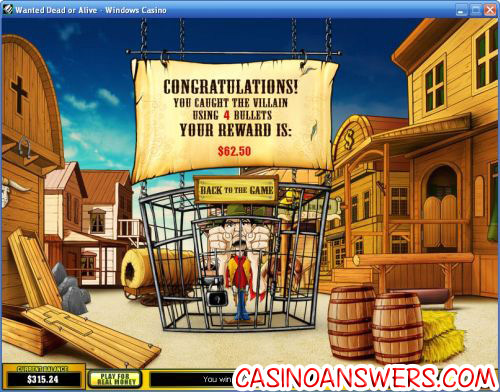 Wanted Dead or Alive Video Slot Guide & Review - Casino Answers! Wanted Dead or Alive is a 5-reel, 25-line video slot developed by Playtech, featuring wild substitutes, scatter symbols, a mini-bonus, a bonus game and a progressive jackpot. You can play the Wanted Dead or Alive video slot game at Omni Casino and Bet365 Casino. Wanted Dead or Alive is a wild west slot machine. During spins, western MIDI music will play along with classic-style gunshots and other sound effects. Symbols include characters Bandit, Loco Devil, Mad Dog, the Dynamite wild symbol, Pistol bonus symbol, Cash Sack scatter symbol and Ace, King, Queen Jack and Ten playing cards. Unlike in many slot games, the Royal card symbols make a lot of sense here, as poker is a common theme in westerns. Bets available on the Wanted DOA video slot are $0.01, $0.05, $0.10, $0.25, $0.50, $1, $2 and $5. You can then set your line bet (1-10 coins) and the number of lines you wish to play (1-25 lines) per spin. The lowest total bet you can make on the Wanted Dead or Alive video slot is a penny per spin all the way up to the highest total bet of $1250. Wanted Dead or Alive has a large betting range, suitable for casual players and high rollers alike. To play all 10 coins and 25 lines, use “Bet Max.” Otherwise, hit “Spin” to play. The 10,000X top fixed jackpot on the Wanted Dead or Alive video slot can be won by hitting 5 Dynamite symbols on an selected payline. The Dynamite symbol is wild and will substitute for all symbols in Wanted DOA except for the scatter and bonus symbols. If you hit three or more Cash Sack scatter symbols in Wanted Dead or Alive, you will activate the Pick ’em mini-bonus game. You will be able to pick one of the Cash Sacks to win a large prize. We bet $2.50 on a spin, hit 4 scatter symbols and won $125! Pistol bonus symbols on reels 1 and 5 at the same time will trigger the Wanted DOA bonus game. You get to select one of three wanted criminals with bounties on their head – Mad Dog, Bandit and Loco Devil. Your job is to use your six shooter to find which of the locations the criminal is hiding in. You only have six shots to find him and the quicker you do, the greater your reward will be. Enable the Dollar Ball mode to play for the Wanted DOA progressive jackpot. The Dollar Ball lottery costs $1 per game. You get 5 numbers out of 49 to choose from. If all five numbers match, you will win the Wanted Dead or Alive Dollar Ball progressive jackpot lottery. You will also receive prizes if you match as few as one number. At the time of this writing, the progressive jackpot is at $10,000. The Dollar Ball feature cannot be activated in free play. Auto is located under “Menu” in Wanted DOA. You have the option of entering the number of spins in Simple Mode or you can use the arrows on the left side to expand the autoplay feature into the Advanced Mode. You can set the stop settings of: Jackpot win, single win more than (up to $99,999), overall Win more than (up to $999,999) and overall loss more than (up to $999,999). You can also set the delay between spins to speed up the autoplay. Autoplay can be cancelled at any time by using the “X” button. Fans of the western genre will have a blast playing the Wanted Dead or Alive slot machine. This here slot’s got a smokin’ top jackpot, a great bonus game and a progressive jackpot side game. For the best online casino to play Wanted Dead or Alive at in the territory, you best head over to Omni Casino. Are players from the United States of America able to play Wanted DOA for real money? Whether you’re a blue or grey, Americans are out of luck when it comes to playing the Wanted Dead or Alive slot game at Playtech online casinos. For a western-themed video slot, you might want to play the Western Wilderness video slot at the US-friendly DaVinci’s Gold Casino. Where can I play a Flash game for free of Wanted DOA? You can play an instant play version of Wanted Dead or Alive with absolutely no download required at both Omni Flash Casino and Bet365 Flash Casino. You can play in practice mode or for keeps. If you can’t get the Flash software to work, try installing the latest Adobe Flash Player version on your computer. 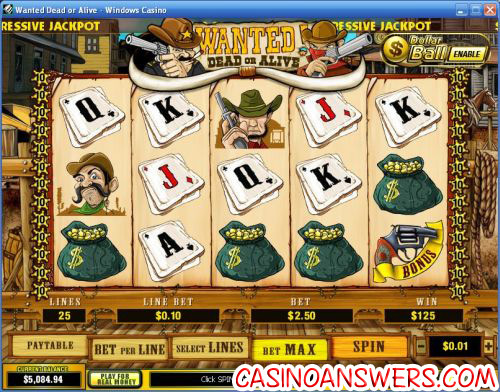 What is the best casino to play the Wanted Dead or Alive online slot at? There are lots of great places to play this video slot, but two of the best are Omni Casino and Bet365 Casino. To see why, you can read our Bet365 Casino Review. Where can I play the Wanted Dead or Alive Flash Game?